Preset styles are a pre-made set of customization elements for all map types. You can customize your vehicle in just one click. Custom styles are a collection of different elements, which you can apply to your vehicle in various combinations. Choosing and combining elements on your own allows you to create a unique vehicle design for each map type. Preset styles are a pre-made set of customization elements for all map types. Each preset style can include paints, camouflage, inscriptions, emblems and visual effects. Rental styles. Styles that can be rented for any vehicle for a number of battles using credits. Main styles. Permanent styles for some vehicle tiers, available for gold for an unlimited number of battles. Special styles. Styles that can be received as a gift in special events, or earned in missions and some battle types, like Ranked battles. Apart from the balanced design for all map types, preset styles with camouflage on the hull also provide a concealment bonus. Preset styles are applied to the whole vehicle and cannot be edited. Select a style—it is automatically applied to your vehicle. To see the exterior design for other map types, switch between them on the left side of the screen. While applying a Rental style, you can turn on automatic rent extension—click (Extend Rental Period) in the radial menu in the center of the screen. To rent or buy the selected style, click Go to Purchase in the upper-right corner of the customization panel. In the screen with the elements for purchase, click Purchase and Exit. To undo all changes and cancel the purchase, click Cancel in the window above the Go to Purchase button. If you change your mind and decide not to buy one or more customization elements, clear the corresponding checkbox in the screen with the elements for purchase. Go to the PRESET STYLES tab. Click the vehicle, then click (Remove Style) in the radial menu displayed. The removed styles are preserved and can be reapplied to the same vehicle or to any other for which this style is available. You can also sell permanent styles purchased using credits: right-click the style and select Sell. Rental styles can be removed and reapplied to the same vehicle until the end of the rental period. However, they can’t be sold. Custom styles are a range of customization elements that you can apply to your vehicle in various combinations. Every nation has a range of paints available for vehicle decoration. 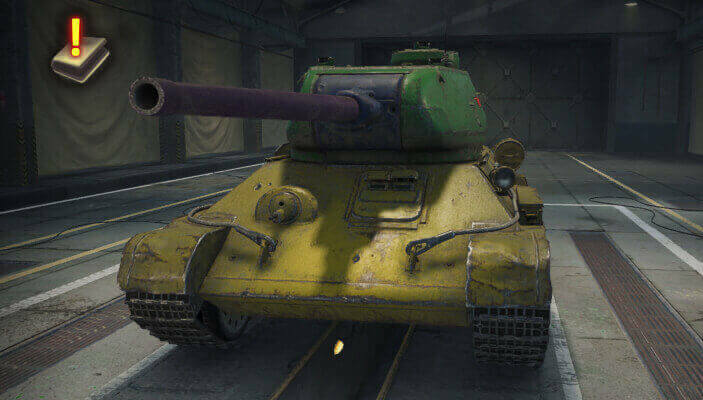 Paints can be applied to five vehicle parts—the hull, turret, suspension, gun and gun mantlet. It takes one paint bucket to paint one part. So, you need a maximum of five buckets to paint the whole vehicle for a map type. This exterior customization is functional and can enhance your vehicle’s concealment. You can apply three types camouflages that change automatically depending on the map you are playing on. Camouflage can be applied separately to the hull, turret and gun. This allows you to combine camouflages. Apart from different combinations, you can also edit the scale and, in some cases, the color palette for each camouflaged vehicle part. To get a concealment bonus, you have to apply camouflage to the hull. If you camouflage only the turret and the gun, your vehicle’s visibility is not affected. Large images that spread over several vehicle parts. You can scale, flip the image horizontally, and shift its position on some vehicles. Depending on the vehicle model, there are from two to five slots available for decals. Note: the number of decals applied simultaneously on a vehicle is limited to two. Vehicles can be decorated with emblems instead of standard flags and signs, like red Soviet stars or German crosses. Depending on the vehicle model, you can apply one or two emblems to it. A decorative element represented by a short text or number. Textual inscriptions are non-editable and can be either specific to a certain vehicle nation or applicable to any vehicle in the game. As an option, you can decorate your vehicle with a tactical number—an editable digit combination with a range of fonts available. Depending on the vehicle model, you can apply one or two inscriptions to its turret or hull. With effects, you can give your vehicle a battle-hardened look or make it shine like a brand new combat machine, fresh from the garage. Effects allow you to add wear or gloss to the paints and camouflages applied to your vehicle. 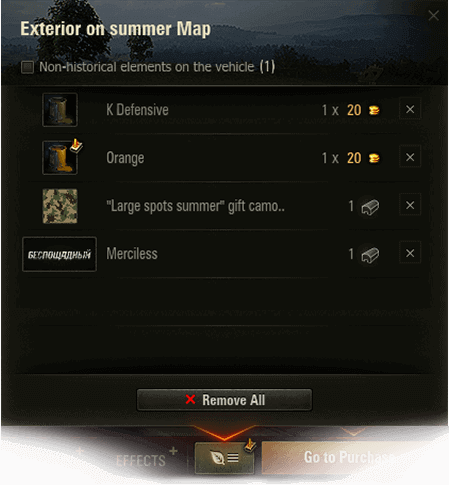 In the left part of the screen, select a map type for which you want to customize your vehicle. 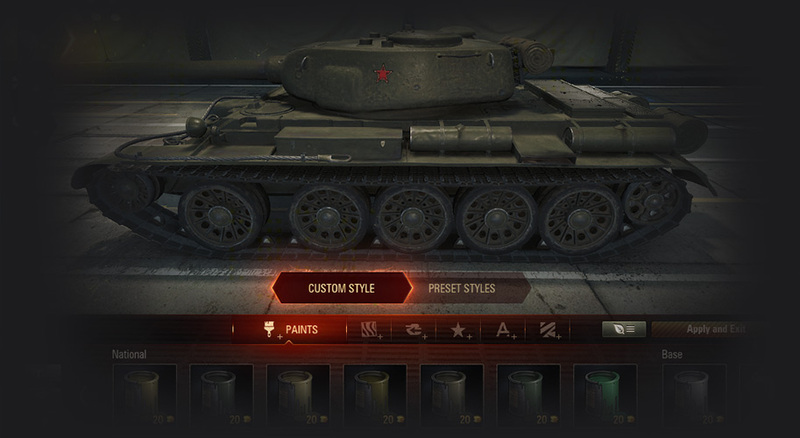 In the customization panel, click the paint, camouflage, or any other element. The element’s icon is displayed to the right of the cursor . Click all the vehicle parts you want to customize with this element. 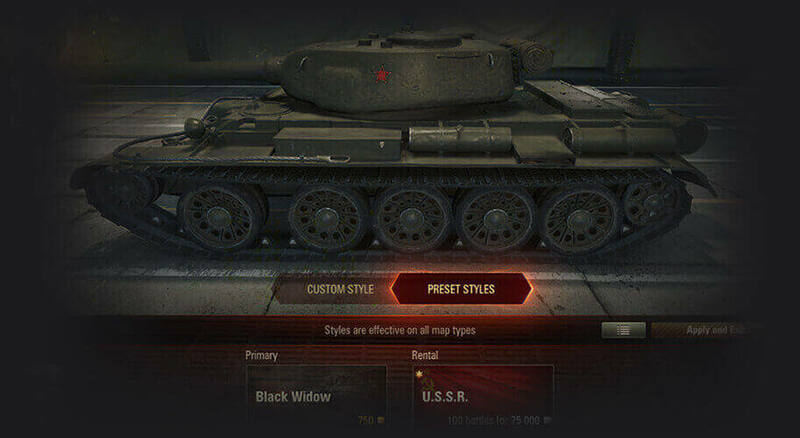 To speed up, click Paint Whole Vehicle for paints and camouflages, or Apply for All Types of Maps for emblems, inscriptions, and styles in the window to the right of the vehicle. Paint the whole vehicle for the selected map type. Remove paint from the vehicle part. Change the camouflage color palette. Some camouflages in the game have three color schemes available. Scale the camouflage pattern. There are three sizes available: x1 (small), x2 (medium), and x3 (large). By default, all camouflages are applied in medium size. Apply the camouflage to the whole vehicle for the selected map type. Remove the camouflage from the vehicle part. Shift the decal position on the vehicle part. This setting is available only on certain vehicles. Scale the decal. There are three sizes available: x1 (small), x2 (medium), and x3 (large). By default, all decals are applied in large size. Apply the emblem for all map types. Apply the inscription for all map types. Apply the effect for all map types. Remove the effect from the vehicle. To exit the radial menu, click (Close Menu). Note: if any customization settings were applied, they are not cancelled upon exiting the menu. To buy the applied customization, click Go to Purchase in the upper-right corner of the customization panel. In the screen with the elements for purchase, сlick Purchase and Exit. To view the current list of applied customization elements for the selected map type, click to the left of the Go to Purchase button. To view only the elements you have in stock, use a special filter: click (In Depot) on the left side of the customization panel. Go to the CUSTOM STYLES tab. Select the map type and the type of customization you want to remove. The vehicle parts with the selected customization applied are marked with a special icon . Click the part you want to clear. In the radial menu displayed, click the Remove button—for example, Remove From Turret or Remove Emblem. To remove uniform painting or camouflage, click Remove from Vehicle. To remove emblems, inscriptions, and visual effects applied for all map types, click Remove for All Map Types. To remove all customization and restore the basic exterior for the selected map type, click to the left of the Go to Purchase button, then click Remove all in the window displayed. The removed element is preserved and can be reapplied to the same vehicle or on any other for which this element is available. You can also sell elements: right-click the element and select Sell. By default, all vehicles are displayed only with a historical or basic exterior. The display of non-historical designs can be turned on in the game settings. Pay attention to the button in the upper-right corner of the customization panel. Once you apply a non-historical element, a special icon is displayed. If you want all players to see your vehicle’s custom style, click and remove all non-historical elements from the list. If necessary, pick alternative options among the historical elements. Paints, main styles with paints, and effects are available for Tier VI–X vehicles. 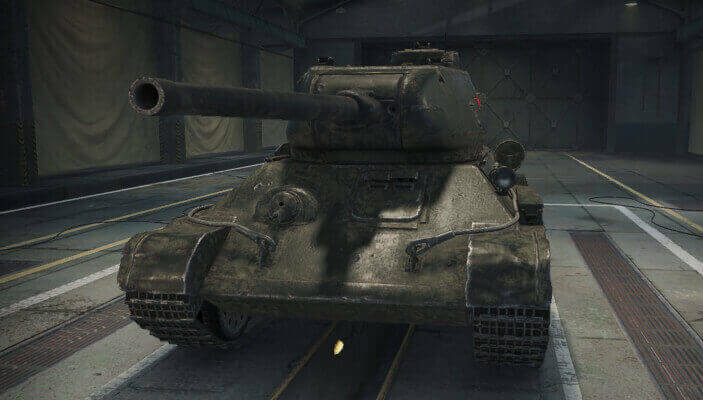 Decals are available for Tier VIII and X vehicles.